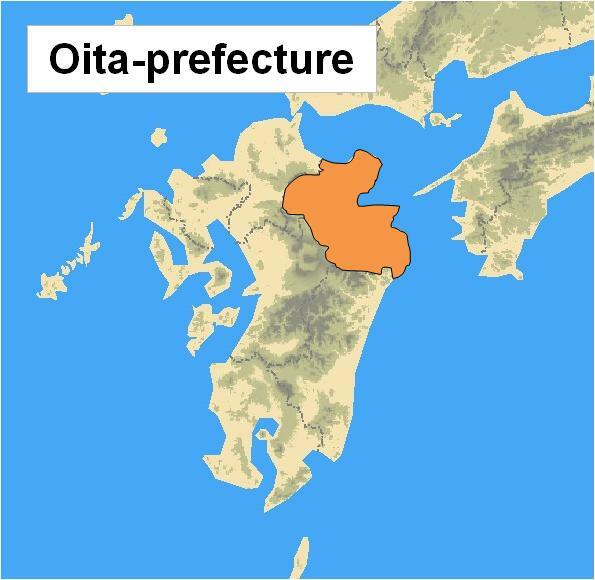 Oita-prefecture is on the north-eastern section of Kyushu. and hot spring flowing volume are both Japan’s largest. 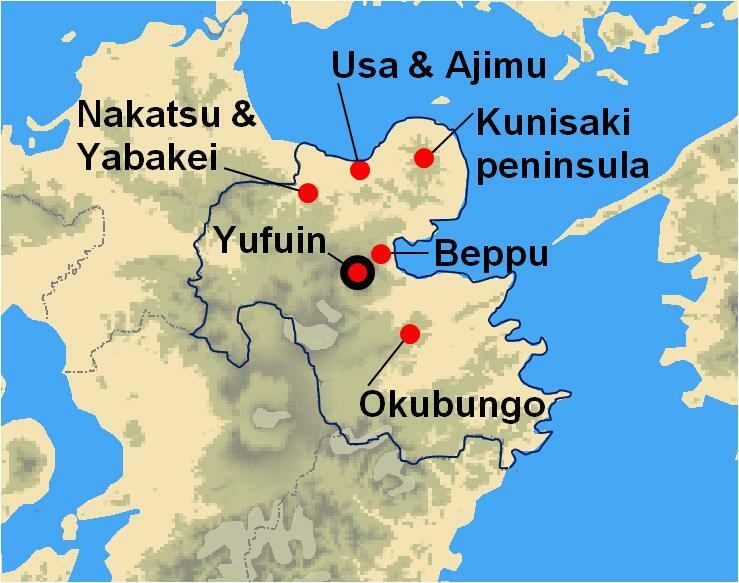 Most recommended Onsen Resorts are Beppu and Yufuin. place harmonized with nature in the basin of mountain hill area. Nature-blessed region at Ono River basin, the northern part is surrounded by Aso & Kuju Mountains. 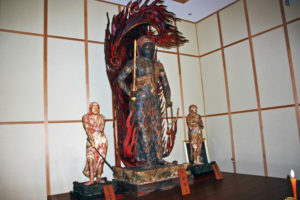 Okubungo consists of Takada, Kuju, Kusu,Kokonoe, Bungo-ono and Ogata. 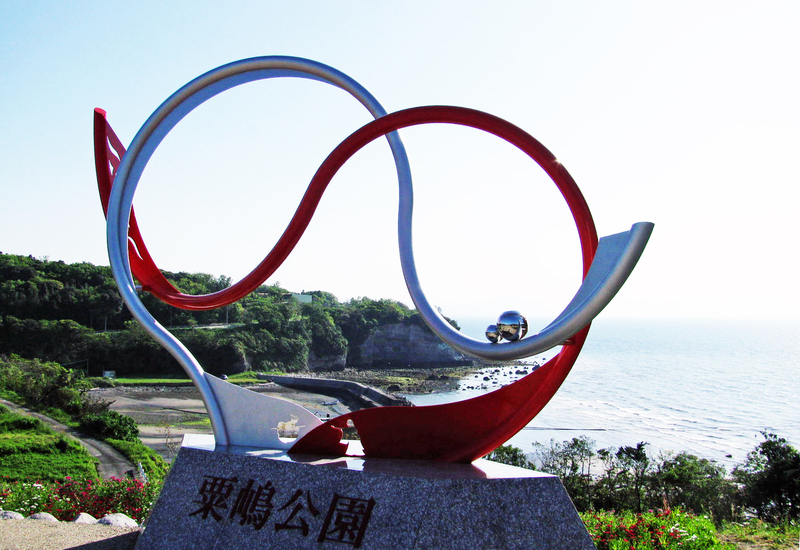 Located at the base of Kunisaki peninsula and spreading around Usa Shrine. and valleys were often chosen by monks as practice ground for meditation. 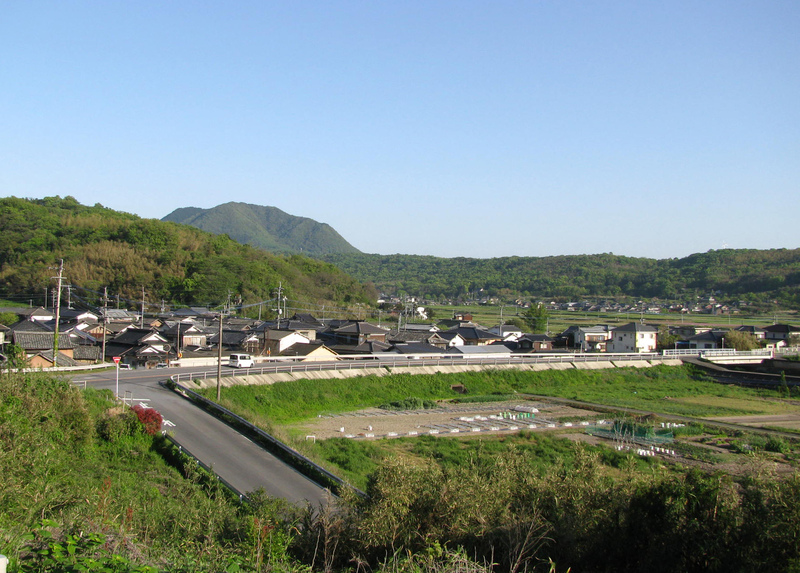 Rural area centered on mount Futago, pilgrimage, trekking, onsen, local cuisines can be enjoyed. by mountain and nature worship, Buddhism, and Usa shrine rising in the region. 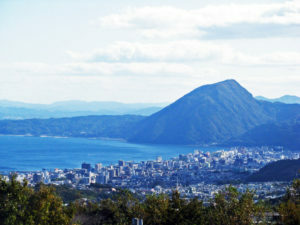 A small city on the north coast of Oita-prefecture, just east of its border with Fukuoka-prefecture. kilometers with a population of almost 85,000.
and a half from the Yufuin station. as baths often were before the arrival, during the Meiji period ( 1869 – 1912). Kamenoi Besso, a featured accommodation around Kinrinko lake. and now comprises almost 500 square kilometers with a population of almost 85,000. 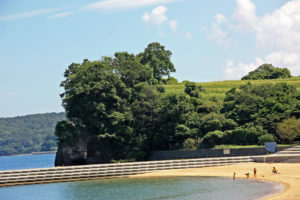 The castle was built in 1588 on the estuary of Nakatsu river. 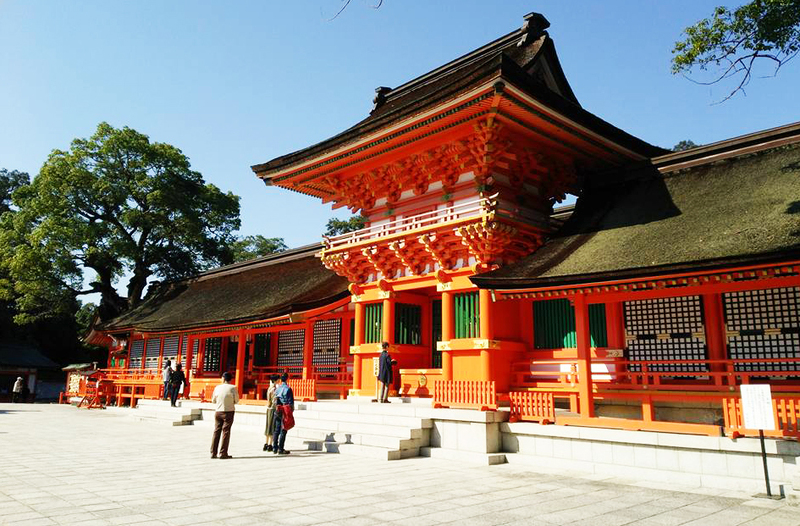 The temple called Akakabe Dera literally means red wall. The approximately 1 km high monolithic rockey mountain. The tunnel built by a monk Zenkai in Edo period, spending 30 years. A historic temple built on the top of the mountain in 645​. Called Hitomi Hakkei, the scenic spot. Cycling road built on the site of the old Yabakei Railroad. The head shrine of Hachiman Shrine that is composed 44,000 shrines that dedicated to the Hachiman Deity. early 8th century. 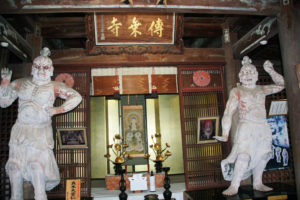 The Shrine is was founded in 727. Enjoy tasting Ajimu wines, The winery located in the natural rich Ajimu basin. found in the extreme climate unique to this region. 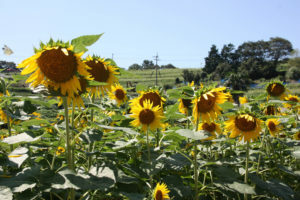 Kunisaki peninsula including Usa are listed on the World Agricultural Heritage. 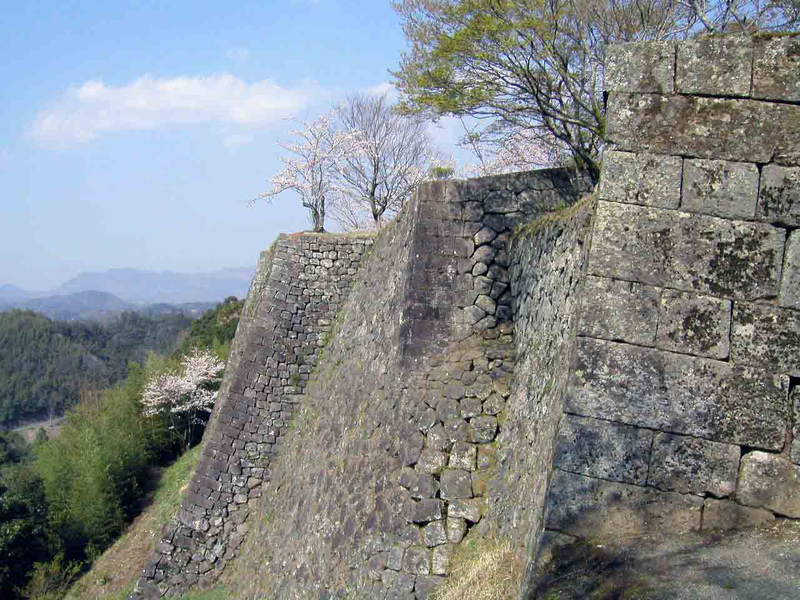 the most prosperous in Kunisaki Peninsula for over 300 years from the Edo period up to 1900. Here remains various old structures and remnants of regional Japanese. established in 718 and the temple building is the oldest extant wooden structure in Kyushu. painted beautifully with colors of each and every seasonal flower in season. period. 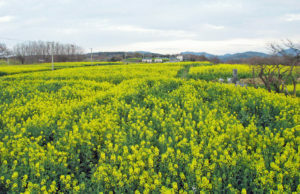 Now included this are, Kunisaki peninsula is listed on the World Agricultural Heritage. they have received government designation as Important Cultural Properties. The Central temple of Rokugo-Manzan in Kunisaki peninsula. 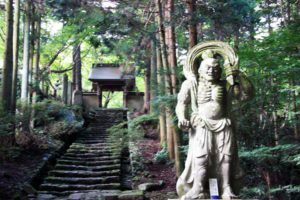 The temple was established in 718 by Ninmon and located close to the peak of Mount Futago. gravel paths and stairs connecting several halls housing various deities. including the Maki-Odo Seated Amida Nyorai (Amitabha). 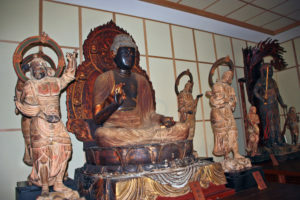 Figure and statues of the Four Devas. All are designated as important national cultural properties. underground, often with unusual result. and two in the more remote Shibaseki district. 6 hells are located within walking distance of each other in this area. up here look like the shaven head of monks. Mountain Hell, a gust steam clear to reveal prancing lion, Bathing hippos and curious chimpanzees. Taking its name from the mountain mud formed over years. temptingly divided into six unique, pots of murky, budding thumping boiling water. down breeding water into the warm. It takes about 5 minutes by car or bus from Kannawa district to this Shibaseki district. Jigoku as written about in the Bungo Topography described as Akayusen, a reddish hot spring. Water spout Hell, a geyser, is a natural monument designated by Beppu city. The Geyser means a hot spring spouting out boiling water and steam in interval. Kinrinko lake is the landmark in Yufuin. Hot water gushes from the bottom of the lake, and hot steam rises from its surface on a cold day. shrine located at the lake’s southern end. 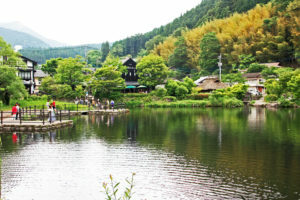 Shitan-yu is the old public outdoor bath with a thatched roof beside Kinrinko lake. of American and Europeans who shames the Japanese into segregating their baths. The most popular pubulic bath in Beppu. You can enjoy various type of Onsen. Hyotan Onsen is a public bath where you can enjoy various type of bathes and is located in Kannawa district in Beppu. The waters of this Onsen contain sodium chloride which is effective for neuralgia and women’s diseases. There are Outdoor bathes, Hyotan bath, Waterfall bath, Steam bath and Sand bath. You can also enjoy meals at the restaurant; local specialty cuisine Dangojiru, or food steamed with the steam from hot spring. out from Kannawa area. The scenery of steam rising from everywhere is wonderful. which people can bath their feet.